News in from Jan-Jaap Minnema at Fraser Yachts that he's signed the 28m classic canoe-stern Feadship motor yacht Najade for sale. Built by Dutch superyacht yard Feadship, she was launched in 1966, and a major rebuild in 2002/2003 saw her hull replated as per survey recommendations and further major work carried out. 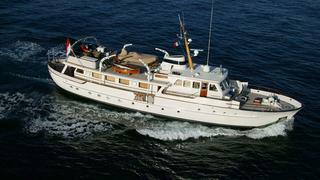 She is now in outstanding condition and bears testament to the quality of Feadship's original build. Accommodation is for nine guests in five staterooms – a master suite, three doubles and a single cabin. A favourite spot for entertaining and relaxation is the sun deck with a large U-shaped sunbathing area, bar, barbecue and a Bimini top – there is also plenty of hidden storage. Twin Gardner 235hp engines give her a range of 2,800 nautical miles. Located in the South of France, Najade is asking €2.45 million.